I decided to go and see the exhibition of Jean Paul Gaultier’s creations today at Stockholm’s Arkitektur- & designcentrum entitled “The Fashion World of Jean Paul Gaultier – From the Sidewalk to the Catwalk”. A wonderful exhibition that no one should miss, with amazing clothes that blur the standard ideas of gender. No women as underordered obejcts, but rather amazon-like strong characters demanding respect. Nice! When buying the ticket for the show, I was offered a combination ticket with entry to Moderna Museum as well. “What’s on there?” was my ingenuous question. 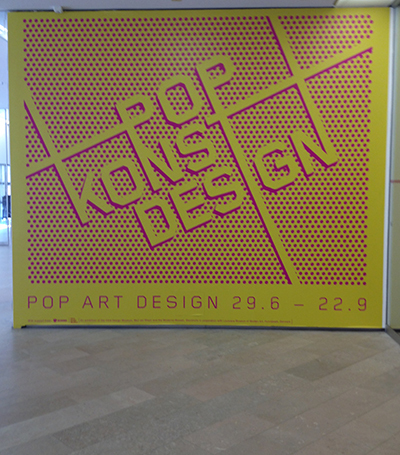 “Oh, the Pop Art Design exhibition opens today” was the reply, Well, I couldn’t miss that, could I? You can imagine my excitement! Unfortunately, photography was forbidden so I have no pictures from the show, but there were classic pieces by Andy Warhol (9 “Flowers”, a beautiful folding screen, Coca-Cola bottles and petrol pump, Brillo boxes), James Rosenquist’s “I Love You With My Ford”, Peter Blake’s “La Vern Baker”, his ex-wife Jann Haworth’s “Cowboy”, Roy Lichtenstein’s “Yellow Brushstroke II”, Richard Hamilton’s “Just What Makes Modern Homes So Different, So Appealing?” and loads of other classic Pop Art pieces by the likes of Jasper Johns and Ed Ruscha. 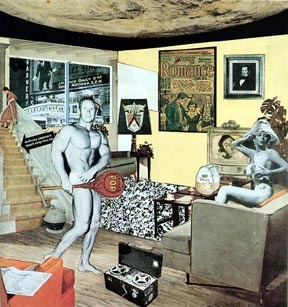 Richard Hamiltons’s “Just What Is It That Makes Modern Homes So Different, So Appealing?”Brillo boxes, 4 Marlon Brandos), Peter Blake (La Vern Baker), Richard Hamilton (Just What Is It That Makes Modern Homes So Different, So Appealing? ), James Rosenquist (I Love You With My Ford), several Claes Oldenbergs and Jann Haworth’s “Cowboy”. There were even a couple of posters; Milton Glaser’s “Dylan” that was included in the US version of “Bob Dylan’s Greatest Hits” album in 1967, Victor Moscoso’s poster for the Chamber Brothers concert – and the cover for “The Velvet Underground & Nico” LP (stereo version). You can tell the difference by how near the top of the cover the “Peel slowly and see” text appears. It is neared the top on the mono cover. The only other record cover was, not surprisingly, “Sgt. Pepper’s Lonely Hearts Club Band”. For once credited to Peter Blake, Robert Fraser, Michael Cooper and Jann Haworth, rather than solely to Peter Blake. However, I would suggest a more correct order: Peter Blake, Jann Haworth, Michael Cooper and Robert Fraser. After all, Robert Fraser’s input was only to suggest to Paul McCartney that “a proper artist” should do the cover rather than the psychedelic group “The Fool” if the cover was to stand the test of time – 48 years on he has been proved right. There were two record covers on show. Obvious choices, both. “The Velvet Underground & Nico” (stereo version in the show) and “Sgt. Pepper’s Lonely Hearts Club Band”. Both albums from coincidentaly from 1967. The latter for once given full credit, viz Peter Blake, Robert Fraser, Michael Cooper, Jann Haworth. I would have listed them i a different order: Peter Blake, Jann Haworth, Michael Cooper (who photographed the album cover picture) and Robert Fraser, who’s contribution was to recommend to Paul McCartney that a “proper artist” do the cover rather than the psychedelic group “The Fool” so that the image would have lasting value. He was right. After 46 years the cover is still regarded as a classic of record cover design. There were also a couple of posters; Milton Glaser’s “Dylan”, which was originally issued as an insert to Bob Dylan’s “Greatest Hits” Album in 1967 and a Victor Moscoso San Fransisco poster for (I think) The Chambers Brothers. The exhibition also included a variety of pop art furniture from the Vitra Design Museum, Weil am Rhein. All in all a splendid time is guaranteed for all! So, if you have the chance, go and see both exhibitions they run until 22nd September. I have mainly collected LPs and have never really been interested in singles or extended play (EPs), which has proved to be a mistake from an investment point of view. Original pop EPs from sixties bands have become valuable as they sold in relatively small numbers. Columbia Records indroduced the LP record in June 1948. RCA Records was initially unwilling to licence this format and were developing its own rival format. RCA introduced the seven inch 45 rpm single in February 1949. The seven inch single could accomodate one three minute recording on each side. However, almost immediately RCA began producing extended play versions of the seven inch disc, with two tracks on each side, increasing playing time to almost ten minutes per side. Paul Maréchal pubished his book “Andy Warhol – The Record Covers 1949-1987” in 2008. The book lists all the records known to have been designed by Andy Warhol that were recognised at that time and lists the formats each was issued in. As most 45 r.p.m. records used the same design as the LP, Maréchal has only illustrated the LP-versions. This list is intended to focus on the seven inch versions and includes a couple of covers not listed by Maréchal. Andy Warhol’s first commissions as a record cover artist came from Robert M. Jones, who succeeded Alex Steinweiss as art director at Columbia Records, soon after Warhol had arrived in New York in 1949. That same year Warhol also received a commission from RCA to illustrate the cover of a promotional EP box released to promote NBC’s “Night Beat” radio serial, which featured Frank Lovejoy as the Chicago Star’s reporter Randy Stone. “Night Beat” was broadcast in the US between Febrary 1950 and September 1952. This promotional release was produced as three EPs on blue vinyl in a box. Incidentally, NBC was a subsidiary of RCA since it was bought by the parent company in 1928. RCA, and its daughter labels (such as Bluebird and Camden), continued to release EPs with selections from LPs throughout the 1950s and usually with the same cover art on the EP as had been used on the LP. Andy Warhol was one of a number of commercial artists commissioned by RCA to illustrate record covers. One of the first, from about 1954, was probably the cover for a project that appears never to have been released. RCA obviously planned to produce a ten inch LP and a double EP comprising eight tracks of jazz piano music entitled “Progressive Piano”, even assigning the release a catalogue number (LJM 3001 for the LP version and 45EP-EJB 3001 for the EP version). 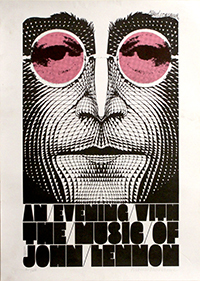 Andy Warhol designed the cover and The Warhol Museum has lithographs of the design. The design of the hands in this illustation is reminiscent of the way Warhol drew the hands on Horowitz’ recording of “Piano Music by Mendelssohn and Grieg” (RCA – LM 9021). A single EP “Latin Rhythms” by The Boston Pops was probably released around 1952. I have not been able to find an LP of Latin Rhythms by The Boston Pops Orchestra from around this time although they did record a 3 LP box with the same title, probably later. The cover of the Latin Rhythms EP is a classic Warhol coloured illustration with four musicians against a background with multiple green and pick blobs. In 1954 RCA released a 10″ LP with Rossini’s William Tell Overture coupled with the Semiramide Overture played by the NBC Symphony Orchestra conducted by Arturo Toscanini and a double EP with these tracks was also released with Warhol’s representation of the famous apple that Tell shot from his son’s head as the cover motif. 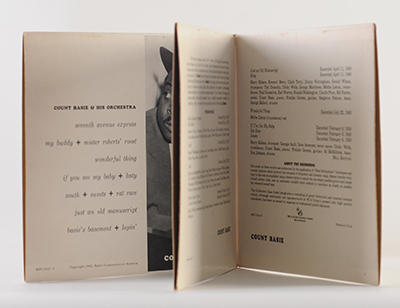 The three Count Basie EPs were released separately in Germany, each having the same Warhol Basie portrait on the cover (catalogue Nos: EPC 1112-1, EPC 1112-2, EPC 1112-3). 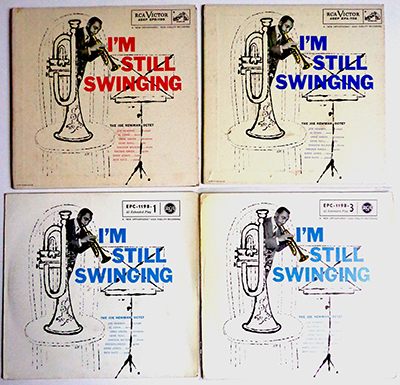 RCA also released EPs of the Joe Newman Octet’s “I’m Still Swinging” LP at about the same time as the Count Basie set on three separate EPs. The only difference in the cover art was a change from red to blue in the colour . Similarly, the company released a double gatefold EP of the Artie Shaw “Both Feet in the Groove” LP. According to Guy Minnebach there were several different tints of blue on the EP covers. 4 EP covers for the Joe Newman Octet 45s. Courtesy of Guy Minnebach. The recording of Gershwin’s “Rhapsody in Blue” together with Grofé’s “Grand Canyon Suite” was issued as an LP that is not included in Maréchal’s book. The cover illustration has since been generally accepted as a Warhol drawing. A box set of two EPs was also released (catalogue No: WBC 1045). Keely Smith’s first LP “I Wish You Love” was released on the Capitol label in 1957 and there was a 45 r.p.m. EP with the same cover art. The front cover has a cheezy portrait of a smiling Keely and on the rear cover a drawing of a hand holding a bunch of flowers. The drawing is definitely in the style of Andy Warhol, but he is not known to have had any association with Capitol Records. Further, in 1957 Warhol was an acclaimed commercial artist and many others had adopted his drawing style, so we cannot be absolutely sure that this illustration is by Andy Warhol, but I list in just in case. Another compilation of Artie Shaw’s tracks from the 30s and 40s was put together by RCA in 1958 with the title “Any Old Time”. The LP had a cover photo by Raymond Jacobs and Warhol’s drawing of a chain of clock faces on the reverse. The EP version hade a slightly different arrangement of the clocks. 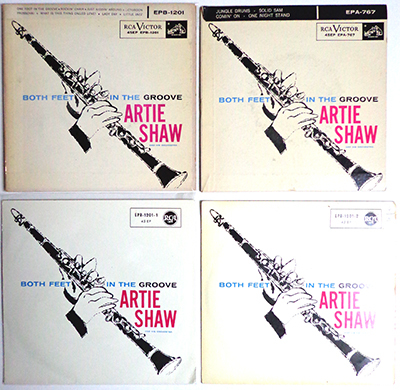 Artie Shaw’s “Both Feet in the Groove” EPs. Courtesy of Giy Minnebach. I have not been able to find any further 45 r.p.m. discs with Andy Warhol art released in the fifties or sixties. The next one seems to be the promotional EP for The Rolling Stones’ “Love You Live!” album from 1977. The EP, released both as black vinyl EP in a picture sleeve and as a picture disc (according to Guy Minnebach, probably a bootleg), features four of the polaroid pictures Warhol took of the band members biting or licking each other. There are lots of later seven inch records with Andy Warhol covers and I will follow up the 45 r.p.m. releases from the eighties and after, that have Andy Warhol’s art in future posts. I’d like to thank Guy Minnebach for his constructive cristicism of this post, which has led to some major improvements. My romance with Andy Warhol’s art began when I saw the Andy Warhol exhibition at London’s Tate Gallery (now The Tate Britain) in 1971 and I bought the exhibition poster and catalogue. I’ve seen many exhibitions of Warhol’s art since. The fascinating thing about Andy Warhol’s art is that it covers so many fields. There are exhibitions of his commercial art, book illustrations, drawings, portraits, photographs films and probably other facets of his enormous production. And then – of course – there is his record cover art! 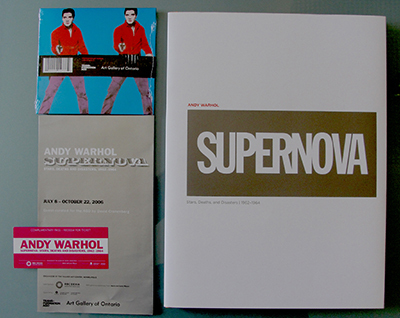 One, not so recent, exhibition “Supernova – Stars, Deaths and Disasters 1962-1964” was held at The Art Gallery of Ontario, Canada, from 8th July to 22nd October 2006. The Exhibiton was co-curated by filmmaker David Cronenberg and The Art Gallery of Ontario’s David Moos and sponsored by RBC Dexia. Cronenberg narrated commentaries to many of the works on show and the commentaries were collected on an exhibition CD entitled “Cronenberg on Warhol“, produced in a limited edition of 500 copies that was sold at the exhibition and has long been out of print. The Art Gallery of Ontario published a lavish book (A4 size) to accompany the exhibition and the sponsors produced an exhibition pack for their guests comprising the book, the CD, the exhibition programme and two complementary entry passes all enclosed in a transparent plastic case. Last year, Kevin Kinney discovered a copy of the CD on Ebay. It has Warhol’s Double Elvis on both front and rear cover and the use of the images was authorised by The Warhol Foundation. So this has to be regarded as a bona fide Warhol cover. I needed to find one, so I contacted The Art Gallery of Ontario to try to obtain another copy, only to be told that they sold out during the exhibition. So my search began and in February I had the good luck to find someone willing to sell the sponsor’s kit, complete with the book, CD, programme, entry passes and, most importantly, the CD still sealed with its obi intact. Because of the weight of the kit, the seller opted to ship it surface mail, so it has taken six weeks to arrive. But it is in pristine condition and a worthy addition to my collection. Record covers are art and several Ebay sellers specialise in selling records with cover art by famous artists. Thus one may find covers by such diverse artists as Picasso, Jean-Michel Basquiat, Raymond Pettibon, Salvador Dali and Keith Haring to name just a few for sale. What is irritating, however, is sellers who do not do their research. Just today, I saw a Rolling Stones picture disc LP advertised as with an Andy Warhol photograph. I recognised the photo as being by David Bailey and informed the seller, who – to his eternal credit – immediately changed his advert. Other, less scrupulous sellers do not pay any attention to comments correcting their adverts. One who I particularly dislike is Majestic Music and Art. This seller not only sells records that they purport to be with Andy Warhol covers that are not, but ignore corrections. Further, they have inflated prices; charging $99 for really quite common covers (at the time of writing they are offering The Dandy Warhols “Welcome to the Monkey House” LP for the exorbitant price of $150!) I feel sorry for those punters who fall for their adverts. I have been a victim of this particular seller. I bought a promo copy of The Rolling Stones “Love You Live” and the East Village Other LPs. These arrived poorly packed and quite badly damaged. Majestic Music and Art refused to discuss a return or compensation. There are many people out there who are interested in, or collect, Andy Warhol’s record cover art. So many,it seems, that I think we should formally inaugurate a Warhol Record Cover Art Club. Thanks to this blog and my list of Andy Warhol covers on http://www.rateyourmusic.com I have come in contact with many experts and, surprisingly (at least to me), I have been credited with a degree of specialist knowledge on the subect. My Andy Warhol record cover collection started in 1967 at One Stop Records in South Moulton Strreet, London when I saw the American import LP “Velvet Undergound & Nico” and bought it for the princely sum of £3.15s. I had been to the Warhol exhibition at the Tate Gallery the previous year and really liked Warhol’s art. Although My copy was an early pressing it did not have the famous “Torso” cover. A couple of years later, my brother gave me a bunch of American LPs including “White Light/White Heat”. So, suddenly I had two Andy Warhol covers. Everyone knows that one item is just an item, but TWO items makes a collection. 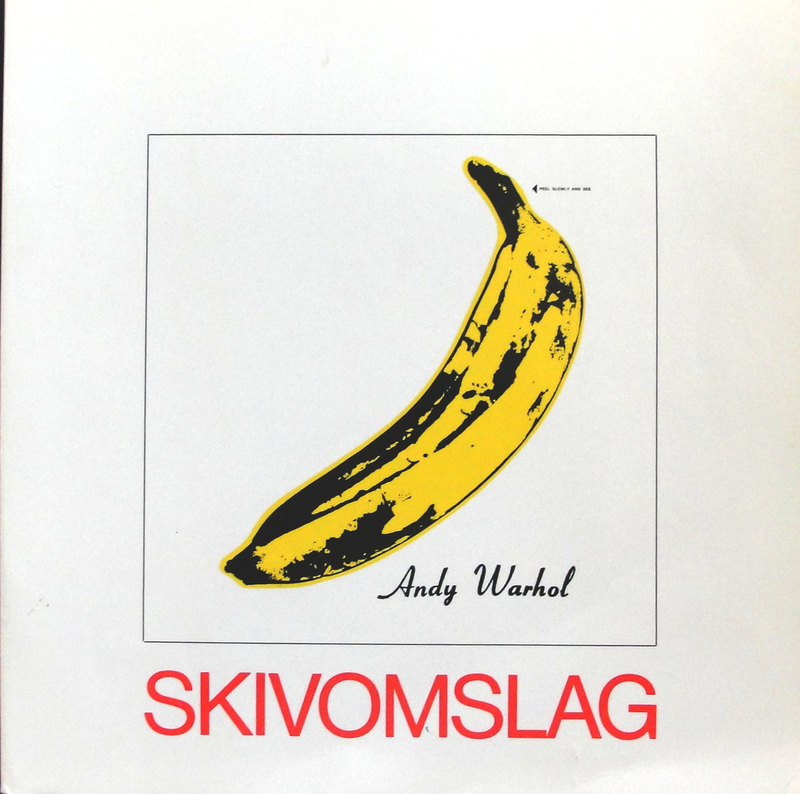 Other records with Andy Warhol cover art followed sporadically. I bought The Rolling Stones’ “Sticky Fingers” and “Love You Live” albums when they came out and I remember finding French re-issues of Kenny Burrell and Johnny Griffin Blue Note LPs. I was given Diana Ross’ LP as a Fathers’ Day present in 1982 and in the early 2000s started to search for other Warhol covers via the Internet. I found Ebay to be a great source of information and – in those days – early Warhol covers could still be bought cheaply. I started buying and selling covers and improving my collection only collecting items in good condition. Once into buying Warhol covers, I met up with Guy Minnebach, another collector, who helped me find several rare covers from sources outside Ebay. 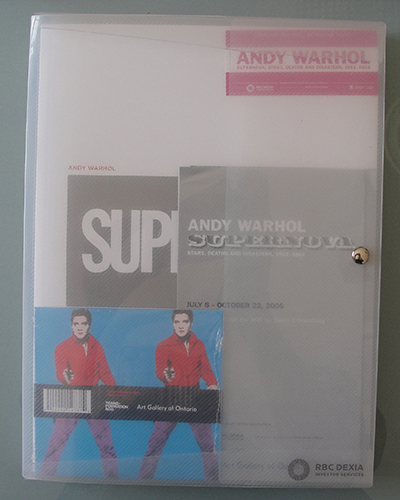 When planning the “Happy Birthday, Andy Warhol!” exhibition in the spring of 2008, it felt obvious to enlist Guy’s help in providing the covers that I still did not have. I will never forget his generosity in sending me several very rare covers so that thery could be photographed for the exhibition! We had never met, only been in contact over the Internet. He trusted me! In exchange, I tipped him off about an original “Giant Size $1.57 Each” being auctioned in Japan. On the subject of the “Giant Size $1.57 Each”; I had a limited edition of 10 made for the “Happy Birthday, Andy Warhol!” exhibition. 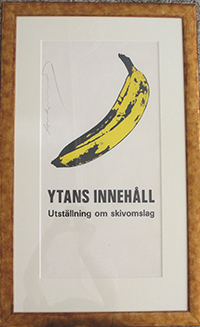 Frank Edwards, another inspirational and knowledgeable Warhol collector has one of these (as well as the exhibition catalogue – which is in Swedish!). Another collector and detective is Kevin Kinney, who finds covers in seemingly unlikely places and must have a huge collection of cover variations. Ken Halperin, a collector of many cover artists has given enormous help in identifying cover artists other than Warhol. A new acquaintance is Fredrik Lindberg, who is relatively new to collecting Warhol covers. I hope he gets his RATFAB soon! I would like to take this opportunity to thanks all the people who have contributed to my collection or provided information and guidance over the years. It’s a project still developing. More covers will almost certainly come to light.